Sometimes a plan comes together and sometimes an educated guess pans out. While it's never safe to plan on any future reality (other than "uncertainty") when it comes to financial markets, there are times where a certain series of events seems more likely than not. For most of 2019, mid-March looked to be one of those times. The year began with a sharp move lower in rates--sharp enough that it was rejected with a bounce back toward higher levels. When that reactionary upward momentum found a ceiling, it set the stage for the sideways range of early 2019. Reason being: several factors underlying the market volatility wouldn't be resolved until mid-March. March has historically been a fairly volatile month for bonds, especially with respect to the Fed. March is the first Fed meeting of the year with an updated set of economic projections. If we subscribe to the notion (a reality, really) that December is a pivotal month for Fed changes, March has been the month where the Fed has the opportunity to make course corrections. This December/March Fed business was more of a factor when press conferences only happened quarterly. Now that Powell is conducting a press conference after every meeting, we may see the pattern break down in the future, but it hasn't broken down just yet! 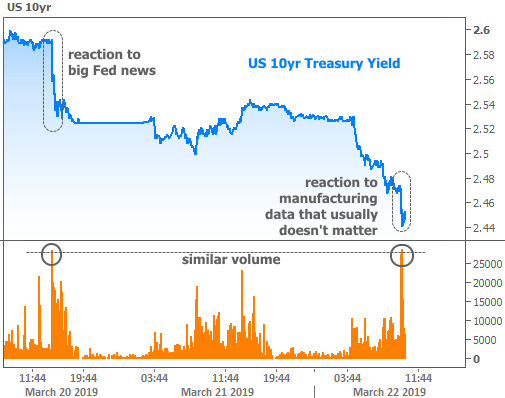 Mid-March has lived up to the hype, and as expected, the Fed Announcement was the final piece of the puzzle (the breakout below began on Fed day). If you see the little hitch in the blue line in the "breakout" section above, that's as far as the Fed news was able to get us on Wednesday. 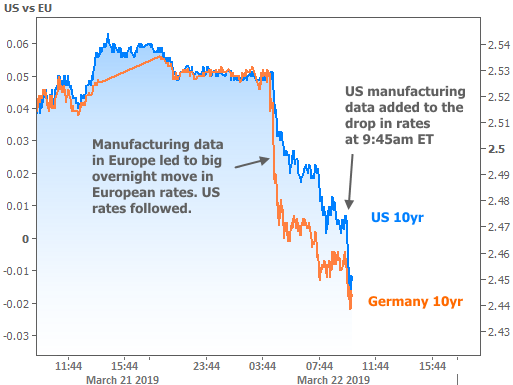 The rest of the move has happened today on a combination of weak European manufacturing data followed by similarly weak US data. The US data in question is rarely a market mover. We're unique in that we vastly prefer the ISM version of the ubiquitous "manufacturing PMI" (a purchasing managers index that basically serves as a monthly GDP for the sector) whereas the rest of the world is keenly interested the Markit version. With today's Markit PMI for Germany, France, and the EU effectively tanking, perhaps US traders were more concerned when the Market PMI tanked for the US. Enough to make for a volume spike that equaled the post-Fed spike earlier this week. Granted, if we ONLY had to deal with US Markit PMI today, we would surely not have seen such a spike. But markets are on high alert after the EU PMI data and the associated swoon in EU bond yields. If you're looking for an even simpler way to explain it, this move is all about fear that the EU economy is contracting rather aggressively, something that was on our radar more than a month ago (read more about it HERE and HERE). 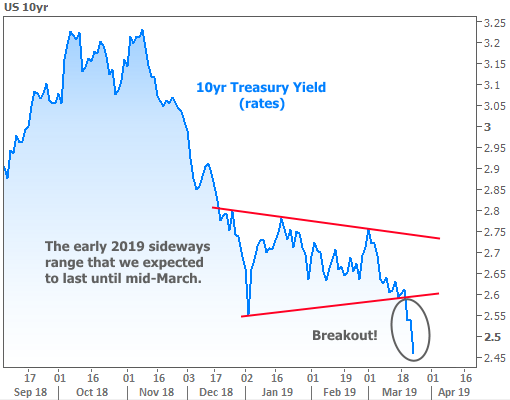 From Feb 7, 2019: "Notably, it looked like there was still a chance for European rates to follow US rates higher at the beginning of 2018. Then the Italian political drama took out one of engines. Trade wars, stock crashes, and more Brexit drama seem to have taken out the other wing over the past few months. This is why many analysts are waiting to see if the EU economy keeps losing altitude. To whatever extent that continues to happen, US bond markets would likely continue to benefit."